This is a very original program. I doubt you’ve heard anything like it before. We definitely broke some rules when we recorded it. The main topics are relationships, dating, and personal growth — nothing unusual about that. What’s unusual is the way in which we made the recordings — and what you’re going to hear when you listen to them. First, there was no pre-planned or scripted content. We recorded the whole thing spontaneously, off the cuff, over the course of three nights at an apartment in Santa Barbara, California. Second, our goal wasn’t to give you how-to advice per se. Instead we opted to share deep insights into what it’s really like for men to passionately pursue an inspired path of personal growth over the course of many years. What were the major stumbling blocks? The unexpected breakthroughs? The subtler lessons and finer nuances that no one talks about? Third, we committed that we would go deep and that we’d be as real and authentic as possible. What could we share that we’ve never shared publicly before? Where are our current edges of growth today? How are we continuing to tackle our greatest challenges? The six contributors to this program, including me, are all coaches, explorers, and communicators. We’re used to sharing ideas and advice with people who want to learn from us. But often that kind of sharing is done in a very controlled and deliberate manner. What would it be like to give people a glimpse into what we talk about behind the scenes, when no one else is around? Would other people find value in being a “fly on the wall” to listen in on that kind of discussion? And finally, we drank 10 bottles of wine while we made the recordings. Yes, really! That was enough to loosen us up and perhaps influence us to share even more, but not so much as to make us foggy or incoherent. I know that many of my readers don’t have many friends who are into personal growth. A survey I did a few years ago revealed that 40% of my readers say they have zero friends who are into personal growth, and another 20% only have one friend like that. This makes it difficult for them to enjoy the social support that can make big lifestyle changes and stretch goals so much easier. When I tell my friends about new experiments I want to do or new paths I want to explore, I generally receive tons of encouragement. I’m well aware that many of my readers aren’t so lucky. One of the reasons I wanted to record a program like Imaginary Men was to give you a realistic glimpse into what it’s like to hang out with a bunch of growth-oriented friends. The other contributors to Imaginary Men are all younger than me. Most are in their 20s. We’re all lifestyle-first people who don’t have regular jobs. We love life and embrace new experiences. We make a lot of mistakes, rebound quickly, and keep on going. If I invited a bunch of friends in their 50s and 60s, with decades of speaking experience and established business empires, and made a similar product with them, I’m sure it would turn out very differently. They’d sound eloquent and wise to be sure, and their advice would probably be very agreeable, but in the end I think the result would be very tame. I think they’d have a hard time communicating the same way I see them do when they’re off the stage and not being recorded. Many people in this field have created brands that are associated with their on-stage persona; as soon as you put a microphone in front of them, they become their brands. They can be so different though when they aren’t in the public eye. I didn’t want to create this kind of program because it gives people a mistaken impression of what it’s really like to pursue conscious personal growth over many years. With my younger friends in the field, I see so much more authenticity. Much more often I notice that their on-stage and off-stage personas are the same. If there is a difference, it’s usually not much. They don’t already have huge empires to protect or publicists to appease, so they can afford to take more risks. Candid, behind the scenes conversations with friends of all ages are tons of fun and very rewarding. But many of my older friends would never let anyone record and publish such insider conversations. It would be too intimate and too risky for their business models. My younger friends, however, almost invariably love the idea. I think one reason is that they grew up with very different cultural influences, like social media, which makes them feel a lot more comfortable sharing aspects of their lives publicly. This was definitely an experimental project. We weren’t sure it would work. But we figured that it would be a fun thing to try. Maybe it would yield something that other people would find worthwhile. We knew it would be a fun experience to create it, and we’d all get to know each other better. Everyone was enthusiastic — and hopeful — to make the attempt and see what we could co-create. There was a certain excitement to not knowing in advance exactly what we were creating, what we’d share, or how this would turn out. We could all feel a powerful energy in the room when we made the recordings. When we listened to the final program, we were blown away! It was actually good — really good, we thought. In all honesty I’d say the first 30 minutes were a little slow, but once we got past the intros and warmed up, it flowed beautifully all the way to the end. 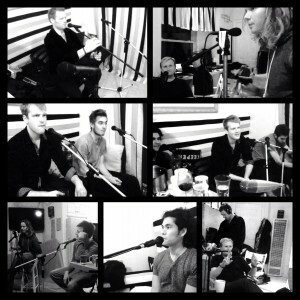 We ended up with 9 hours of deeply honest and very original material. I was especially amazed at how many different topics and ideas we managed to cover — facings fears, letting go of limiting beliefs, overcoming shyness and social anxiety, alternative relationship styles, building confidence, exploring sexual fantasies, unconditional love, attracting quality partners, open relationships, being present, and tons more. You can see a more thorough list on the Imaginary Men website. We decided to released Imaginary Men as a downloadable product (MP3 format), so people can easily listen to it on their favorite devices — iPhones, iPads, Android devices, laptops, etc. We also decided to include several bonuses, including videos of some of the contributors’ speeches and a specially created social anxiety bonus that includes public demos of real exercises you can do to build more social confidence. The bonus content alone is several hours of material and covers some topics in more detail. I contributed a 90-minute speech I gave in Oslo, Norway, last year for one of the bonuses. Finally, we decided to price Imaginary Men very modestly, so that lots of people could easily afford it and enjoy it. It’s just $47. The net income from the sales of Imaginary Men will be split between 7 guys — the 6 contributors plus the professional audio engineer who did all of the recording and editing work for no up-front pay. This helps to support all involved, and it gives us a way to measure interest. If people enjoy this co-creative style, it would certainly encourage me to do more co-creative projects of this nature. Obviously we’d love for you to buy, download, listen to, and enjoy Imaginary Men as much as we enjoyed creating it. The material was professionally edited, so I think you’ll be delighted with the quality of the recordings. But we don’t want to be super-salesy about it. I invite you to check it out and if it appeals to you, give it a chance. 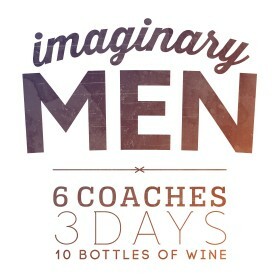 The Imaginary Men website is more story-based than salesy. It shares the story behind the program and how and why we created it. So if you’re in the mood for something uniquely different that may encourage you to grow in ways you never expected, I think you’ll really enjoy and appreciate what Imaginary Men has to offer.